The richest corals in Japan are seen in Sekisei coral sea which locates between Ishigaki and Iriomote islands in Okinawa. However, corals close to Ishigaki island are declining very quickly and are threatened to disappear. 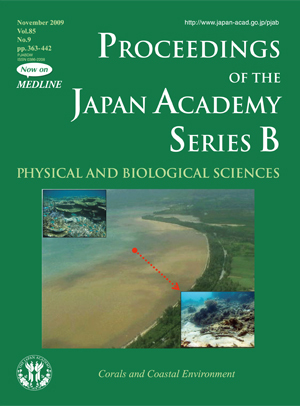 The cover illustration of this issue shows that the water in the nearshore area of Nagura bay of Ishigaki island is covered by the read soil deposition. 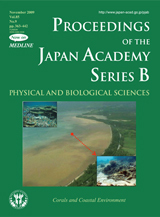 The picture at the upper left corner indicates sound corals seen in the offshore region. On the other hand the picture at the lower right corner was taken in the nearshore region indicated by the red circle. It shows clearly that the corals there endanger by sediment and nutrients deposition. The stated harmful materials are induced by the development of lands, in particular by farmlands for sugarcane and pineapple. In order to decelerate the rapid expansion of the unfavorable coastal environment stated above, remarkable reduction of sediment and nutrients yield is essentially required. From such a view point, the contribution of the present paper (pp. 374-390) can play an important role to establish a rational critical concentration of the sediment and nutrients for surviving the corals. Based on their achievement, a proper combination of civil engineering countermeasure and change of farming method can be recommended to the related personnel in the near future.